These Easy Sheet Pan Steak Fajitas make the perfect simple and healthy weeknight meal for busy families! 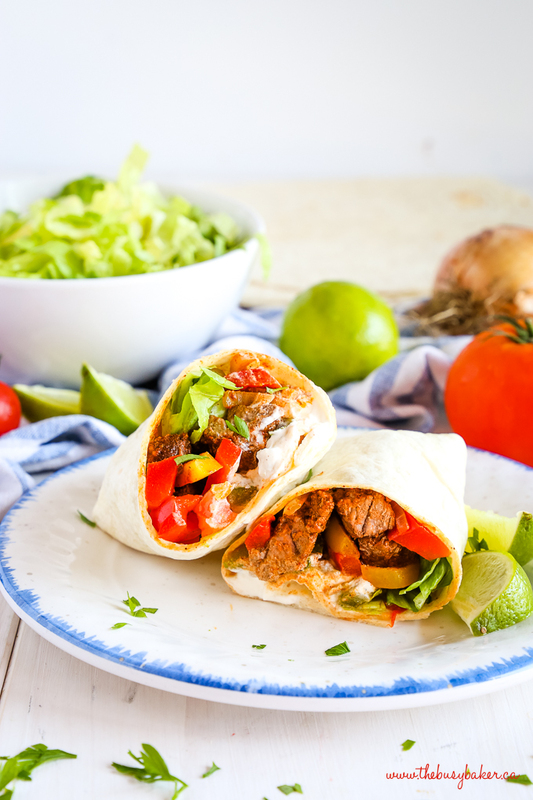 Made with lean beef, fresh veggies and your favourite Mexican-style fixings, and on the table in under 25 minutes! I don’t know about you, but coming up with a delicious meal for our family every day can sometimes be quite the task! 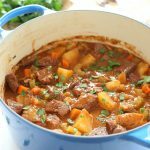 Between food allergies and my kids’ constantly changing tastes, sometimes even I have trouble coming up with a meal idea that the whole family will love…and I do this for a living!! I’ve shared some of my favourite easy family meals with you already (like this Healthy Shrimp Scampi and this Easy Mexican Tortilla Soup), but these Easy Sheet Pan Steak Fajitas are my latest favourite weeknight meal to make in a pinch! And can you blame me?? Not only is the steak and veggie filling for these fajitas crazy easy to make and SO flavourful, these Easy Sheet Pan Steak Fajitas are totally customizable to everyone’s individual preferences, making them a perfectly versatile meal for your family and mine. 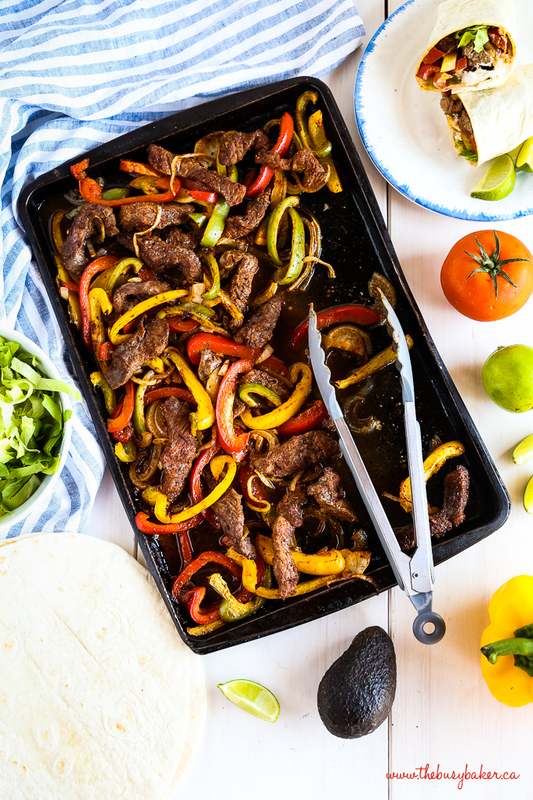 My kids LOVE these Easy Sheet Pan Steak Fajitas and if there are leftovers, they never last long! LOOKING FOR MORE EASY WEEKNIGHT MEALS? CLICK HERE FOR A LIST OF ALL MY FAVOURITES! We live a busy lifestyle, just like your family probably does – our kids take ballet and piano lessons, and go to school every day, I’m a work-at-home mom, and my husband works crazy hours most of the time, so it feels like we are always on a tight schedule, especially on week days. 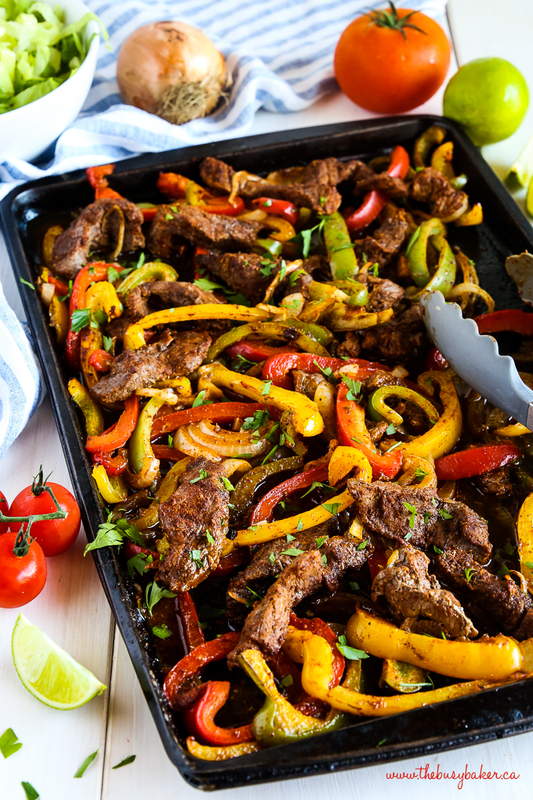 Getting a healthy, wholesome, and filling dinner on the table for my hungry family in 25 minutes or less is no longer a challenge with these Easy Sheet Pan Steak Fajitas!! And the clean up is easy too – only one pan to wash! 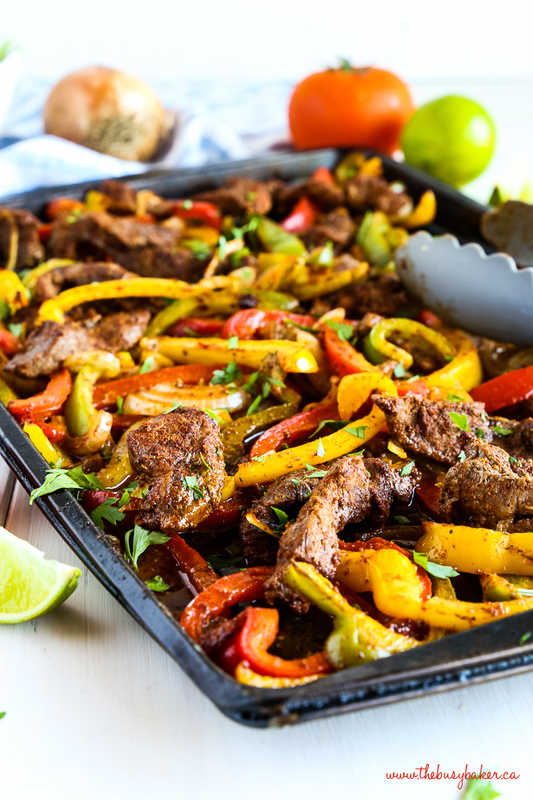 I hope your family loves these Easy Sheet Pan Steak Fajitas as much as our family does! Let me know in the comments below, what’s your family’s favourite 25-minutes-or-less meal made from scratch? I’d love to know! Super excited to try this! I just did chicken fajitas the other night and it was so many dishes. This method looks wonderful! Can’t wait to try this one, though I’ll be cutting the ingredients in half (just cooking for 2) I LOVE sheet pan recipes, line the pan with foil and NO MESS TO CLEAN UP! Thanks for another winning recipe, Chrissie! So glad! I hope you love it! Such a quick and easy meal! 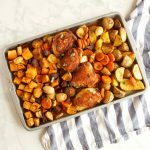 This sheet pan meal takes the win! This is definitely my kind of lunch! 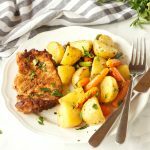 It’s one sheet pan meal, so I love this recipe even more! 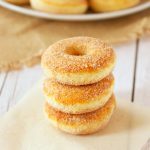 I think my family will thank you for this recipe! So perfect for our movie nights! 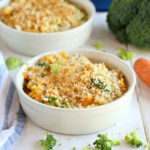 Perfect weeknight dinner! 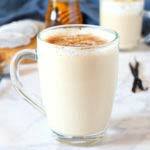 So easy and delicious! These look so perfect! Great for weeknights or even game days!! 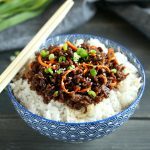 My family really enjoyed this, and I liked how fast and easy it is to prepare. Thanks for a keeper! I love steak fajitas! 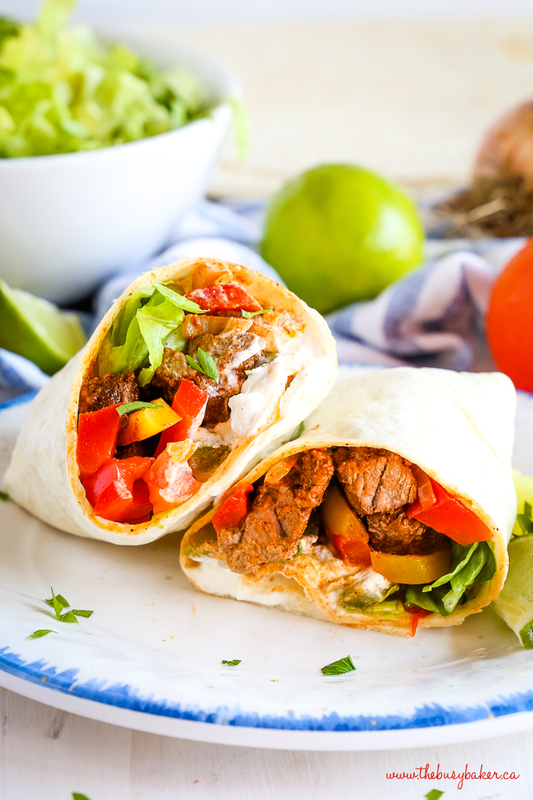 There’s nothing like the sound of fajitas when they’re ready. Can’t wait to try this recipe! The easiest and the healthiest dinner ever! My kind of dinner! My family would really LOVE this!! It looks incredibly delicious! I’ve been wanting to try a steak sheet pan dinner. You make it look so easy!